Driving from the Foxconn Factory, down the road from the main gate, we spotted a truck full of pigs in an open-sided container. They were huge, porcine pink, and surprisingly clean. They were still alive – but wouldn’t be for long – and they were, we could only presume, destined for the bellies of some of the company’s 400,000 workers. As the truck trundled along the well-paved road, I flicked through the pictures I took of the Foxconn kitchen. It was something out of a delicious version of Hieronymus Bosch: huge cauldrons manned by men and women in white smocks, smoke and steam coming out of huge soup pots, the food flipped and tossed using shovels. There, in the course of the day, nearly 400,000 meals pour out into the campus. There a cooker the size of two truck trailers cleans, cooks, and cools hundreds of pounds of rice, and some of those pigs (slaughtered off campus because that’s one thing the kitchen at Foxconn isn’t allowed to do) are stir-fried or stewed and sent out to one of the many campus cafeterias. Back at the kitchen I wanted to confirm how many pigs actually went into Foxconn’s mess hall. After a bit of back and forth, the kitchen staff concurred. “About 90 here and 80 at the other kitchen. Sometimes more,” said our guide. The kitchen at Foxconn is important because, like the company, it is a black box. I saw a model of the facility, carefully laid out on a piece of plastic turf and complete with little LED lights tracing the path of any one of those nearly 200 pigs from loading dock to loading dock. It’s like a circuit diagram or a model of a digestive system. Raw materials enter at one end, are unloaded, and sorted. Rice go on one path while 40 metric tons of vegetables and legumes head a different way. Meats go into the main artery, into a walk-in freezer the size of a U.S.-style grocery store, and then into the main hall where meat is cut, marinated, and prepared. Huge woks, fire belching from below, line one whole row and here the workers, their hats color-coded based on skill and experience, prepare meals. In the rice channel, a huge, Japanese-made rice cooker, preparing countless tons of rice per day. A soup kitchen runs formulaically, creating food based on set measurements of ingredients. The food is rarely tasted, said our guide. Most of the recipes were automated. Even the waste disposal systems are massive. The waste water – 3,000 tons daily – that comes from the kitchen is treated and reused in the sewage system, thereby reducing the load on the surrounding infrastructure. The oil used in the cooking facility is converted to biofuel to power some of the facilities, including many of the systems inside the kitchen. After preparation, the workers portion out the food or send it in huge pots to one of the many cafes on campus. There are two bakeries – Chinese and a Western bakery – where almond cookies and black bean buns are prepared alongside kaiser rolls and white bread. The system is massively efficient from beginning to end, designed to feed an army on a daily basis. “The noodle shop near the circle is great,” said one frequent visitor. “The roast beef sandwich only has one thin slice of beef. The tuna melt was my preference for lunch, but it didn’t sell, I guess, because it was off the menu last week.” The lunch I had – fish, rice, a few slices of savory beef – was quite delicious and well-prepared. Another important center is the safety monitoring system, a stem to stern view of everything that goes on in the kitchen. In what looks like the lair of an evil mastermind, a few dozen screens are connected to cameras trained on various spots around the campus. In one ominous feed you see the nets in sharp focus over a parking lot. The rest of the video considerably less nefarious. Workers in while smocks prep vegetables. The soup men ladle out sour melon into a huge pot. If an army marches on its stomach, so does Foxconn. This kitchen, and the cafes around the campus, are what differentiates this campus from any other factory I’ve seen. Most factories have cafeterias, usually run by a caterer like Sodexho, but except for a few licensed purveyors in the factory most of the food comes through this efficient kitchen. Food is, for the most part, subsidized if not free and the employees get room and board as part of their work plan. With few expenses the little money they make can go back to parents at home or into savings. On the whole it’s a patriarchal system that had worked for decades, ensuring loyalty at the price of ten hour workdays and around-the-clock work when major orders come through. On a macro scale, Foxconn, like the kitchen, is also a black box. Products go in, products come out, and along the way waste and effort is conserved by the watchful eye of thousands of managers. Is it completely efficient? Absolutely not, but it’s efficient enough to get the job done quickly and cheaply. 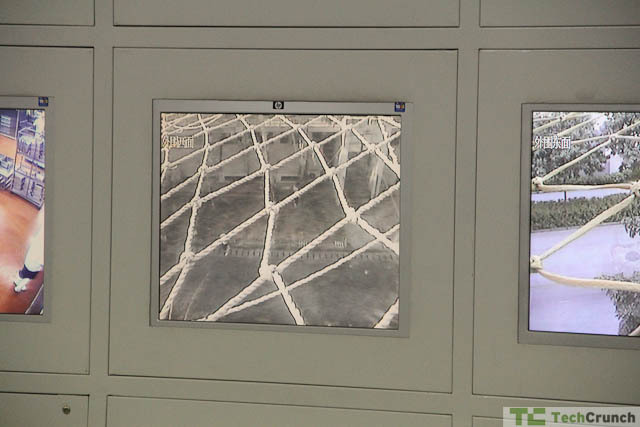 The checks placed on many of Foxconn’s systems mirror the security system in the kitchen. Someone is always watch. There’s even a bathroom on the first floor that doesn’t let you out until you wash your hands. A sensor in the door shuts and locks until you’ve spent a little time under the tap. Again, read into this panopticon of control what you will. To many it’s just strong management. Companies trust Foxconn with their secrets, which is why many journalists have never been allowed inside. Testing offices are marked with various warnings and each manufacturer has their own area, with no overlap. Industrial espionage is mostly impossible, except in rare cases, and the rumors that often come out of Foxconn and other factories are planted by folks in the upper echelon in order to increase the stock price for a brief moment. Manufacturers trust Foxconn to offer a tight, well-run ship. Those who claim that the company is essentially trafficking in modern slavery are ignoring the fact that the company exists in order to serve a Western audience. The slightest hint of anything untoward – take the suicides as one example – and the company would lose contracts. Money can cause bad behavior as much as it can cause good behavior. Food goes in, food goes out. Silicon goes in, silicon goes out. It’s an endless flow, a river of revenue that keeps this factory in business. The poetic among us would see some parallel in the hapless pigs being led to slaughter and then stir-fry to the lives of workers “trapped” on the assembly lines, but I see little more than folks eating lunch and, as Foxconn changes, those people may not have to eat at the company cafe much longer. Tomorrow I’ll address the things Foxconn does for clients and, finally, we’ll look at the future of Foxconn as a sales channel and how this massive organization – an organization that can process 40 tons of vegetables on a single day – is trying to save itself. This is part two of a four part series that will run this week about Foxconn. You can read the whole series here.